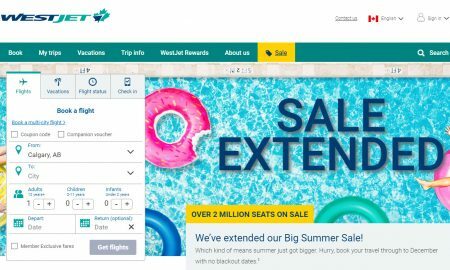 WestJet has extended their The Big Summer Sale. The sale was to originally end on July 19th – it’s been extended to July 23rd. There’s over 2 million seats on sale. There lots of incredible deals on travel through to December with no blackout dates. Sale ends on Monday, July 23, 2018 at 11:59pm MT. With over 2 million seats on sale that’s our way of making your summer even better. Lowest fares for travel to Canada can be found on Tuesdays, Wednesdays, Thursdays, and Saturdays. Lowest fares for travel to the U.S., Mexico, the Caribbean and Europe can be found on Tuesdays and Wednesdays.